Who Says Smartwatches Have to Be Ugly? In this era of modern technology, it is common to see people wired into their smartphones, laptops, and tablets, keeping track on current affairs via the internet. You even see babies watching that annoying “Baby Shark” song on an iPad as a way for parents to keep their kids quiet in a classy restaurant. Out of all this, one tech that is slowly placing itself on the growing market are smartwatches. Admittedly, smartwatches have not quite gotten the attention it hoped for and a lot of this has to do with its style. Sure, having a wearable computer on your wrist sounds cool and James Bond-sy but style-wise, it is completely lacking in that department. Companies that produce smartwatches slowly realize this and have come up with more fashion-forward watches. Gone are the boxy, ugly smartwatches and in come stylish timepieces that you will not be embarrassed to put on. Here are five of the most fashionable smartwatches to date. Emporio Armani might be famous for its sleek suits, but it also has some of the most stylish smartwatches you can find today. This model has all the tech you need packed in the brand’s iconic design making it super stylish and functional at the same time. Also, you can customize the watch dial and strap to suit your outfit, so you won’t awkwardly mismatch your look. If that isn’t fashion-forward, we don’t know what is. Fossil is known to produce many watches but our pick for smartwatches specifically is the Q Explorist model. It is shaped like a normal industrial watch but keeps an elegant look with its smoke stainless steel bracelet. This watch tracks your heart rate automatically and as soon as you put it on during a workout be it a calmer exercise like yoga or a more extreme approach like bodybuilding. So, ditch the Fitbit and go for something that looks cooler like this. 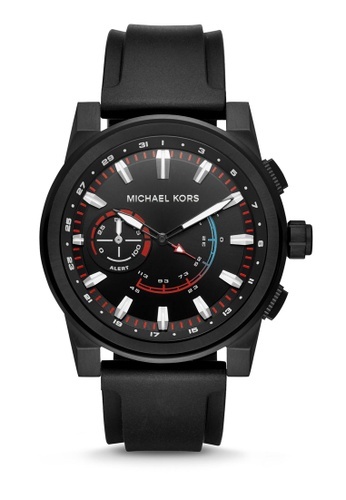 If you are looking for a smartwatch that packs a punch, this beautiful black Michael Kors watch is the one for you. It exudes masculinity with its bulky and sporty feature, suitable for guys who goes to the gym right after his 9 to 5 day job. Its silicone band only separates itself from other smartwatches which typically have stainless steel or leather strap, which only enhances its sporty look. If you have seen a TAG Heuer watch on Walter White’s wrist in “Breaking Bad”, you know that the brand is legit. While Mr. Heisenberg is seen wearing the Monaco, we would recommend the Connected Modular for a more technologically advanced one. With a scratch-resistant sapphire glass, this model is perfect for your extreme outdoor activities as it is durable. But if all the above watches are too over the top for you, you can always stick with the trusty Apple Watch which is by far the most owned smartwatch. Sure, its design is still a rectangle since day one, but users tend to go for this as it is a safe bet to look stylish while having the all functions of a proper smartwatch. See? Who says smartwatches must be ugly? Switch your traditional watch to a more modern one like those five mentioned. But if you have other preferences, feel free to share your suggestions on the comment section below.